Rising in a natural spring in the high Julian Alps at 1050 meters near village of Soca, the 136-km long Isonzo [Soca] flows from the Triglav National Park in northwestern Slovenia to the Adriatic. 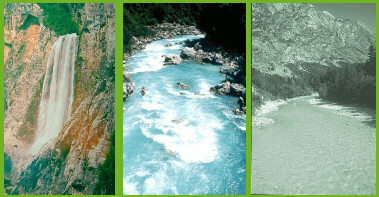 The aquamarine Isonzo [Soca] is one of the most beautiful and cleanest rivers in Europe. Its upper stretch [a non-Great War Area] has magnificent gorges in the Trenta valley and the Boka Waterfall, highest in Slovenia. It is a world class attraction for those wishing to engage in active forms of recreation, especially fishing, camping and various types of boating. The steeper upper sections of the untamed alpine river attract canoeists from all over the world and rafting is also becoming increasingly popular. The southern half of the river starting just east of the Plezzo basin contains four towns critical for understanding the Great War in Italy. Please visit the articles on these locales when they come on-line. Site of the Northern breakthrough point for the Central Power during the Battle of Caporetto, Octob er, 1917. Namesake and joining point for the Northern and Southern forces of the Central Powers during the Great Battle. Launching pad for their further advance to the Tagliamento and Piave Rivers. Site of the critical Southern breakthrough point for the Central Power during the Battle of Caporetto, October, 1917. Gateway to the Carso Plateau on to Trieste, Gorizia was the near the center of nearly all of the first eleven Battles of the Isonzo. At Gorizia the Isonzo [Soca] is joined by the Vipava river, and after passing briefly through Italian territory it flows into the Adriatic Sea. To learn more about the eleven offensives mounted by Italy on the Isonzo line, Click Here. Compiled from various Slovenian Tourism sites.